How I LOVE fall! It is my very favorite season. 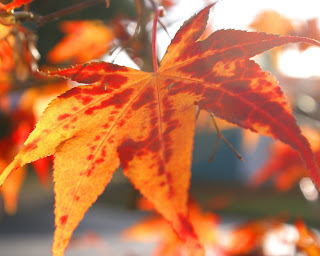 One of my favorite things to see is the beautiful yellow, red and orange leaves blowing by on a sunny day. I so enjoy the pumpkin patch, decorating and of course Halloween!! Its even more special when you have a little one to share it with. Every year, I make pumpkin bread. It is delicious, healthy and my own recipe. Combine dry ingredients. Combine applesauce, pumpkin and eggs seperately and add to dry. Stir just until combined. Bake at 350 degrees for 50-60 minutes. Melt butter and brush over loaves. Sprinkle with cinnamon & sugar.